Yahoo is attempting to regain a foothold in the search market by adding Yelp reviews into their search results. These results have not been integrated just yet but should be available soon, read more here. Google gets another patent granted in February protecting their contextual search term evaluation algorithm. The algorithm weights the value of terms added on as a user refines their search terms in a single session. SEO by the Sea covered it in more detail here. Google also announces a new page that allows you to report scraped sites that outrank the originals. They do not say what will happen when you report the scraped sites, but I am skeptical at best since this is not the first of these programs from Google. Remember the “fight spam” submission page? Twitter is looking for new ways to monetize their site and it looks like offering Twitter users the ability to pay to show up atop the internal search in Twitter is where they are going to start. 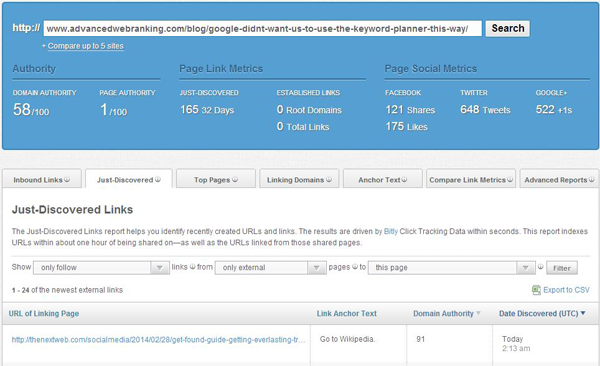 Monitoring back links and analyzing ratios is a favorite of SEOs and Web savvy business owners alike. 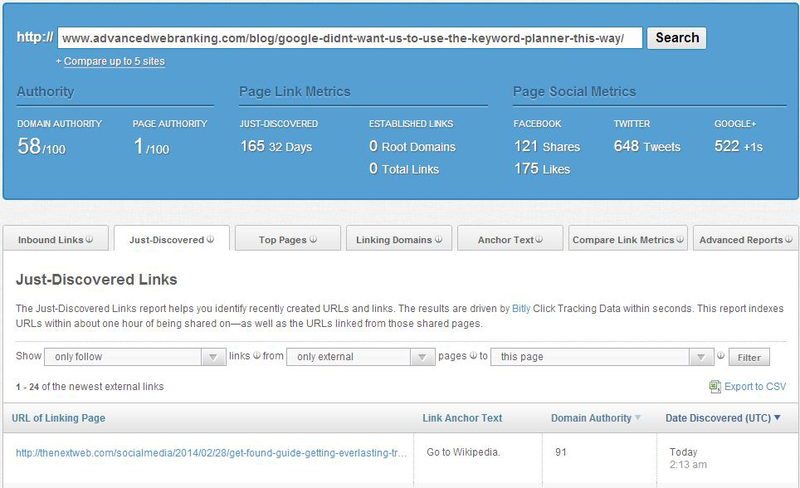 The team at WebMeUp has released a free backlink analysis tool that gives you up to date and detailed results for free. I am adding this to my toolbox and you should too! Those of you serving a local client base and struggling to gain a foothold in local search may want to check out the free local SEO listing tool powered by MOZ. Head over to GetListed and enter your business to see how you appear in the top local directories. You are also able to visit each site from the tool to update your listing. This week I am going to cover Open Site Explorer, (OSE) one of the most used back link analysis tools in the industry. In last week’s SEO roundup we talked about using Klout to find links, now we are going to build on that concept to find links opportunities from OSE based upon already popular content. The first thing you are going to need to do is find a piece of content related to your niche that has been heavily shared and linked to. Klout and Buffer are two good places to start looking. Once you find a popular piece of content, visit the page and copy the URL. Take the URL of the page and enter it into OSE. Sort the links so that you are looking at external links that are do-follow. Repeat this until you find a site with several new inbound links. Here is a good example, as you will see it is getting a number of authority inbound links and has been shared heavily. 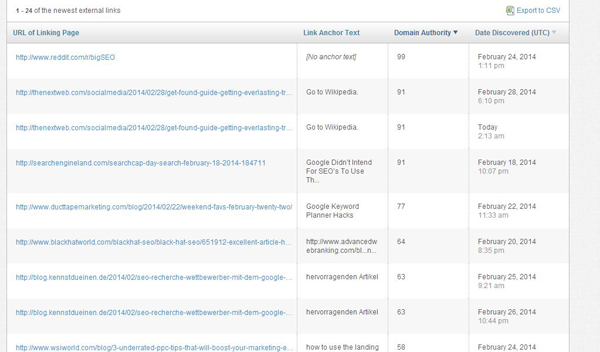 Next you should sort the links by domain authority so you start with the most powerful sites first. It will look like this. Now you have a list of sites that are interested and willing to link to a piece of content covering that topic or a closely related one. Take some time to stop by the top 10-20 sites and see what type of contribution you could make to their site, or if they have a resources page. Do not just send out a generic email to all the pages! Instead, offer each page a unique piece of content or tell them about the awesome content you have made that they may want to link to. This method is extremely simple and can yield some very authoritative links for your new content very quickly. Once you have reached out to the top 20, work your way down the entire list until you have contacted every credible and authoritative site on your list. This week’s SEO tip comes from Neil Patel of Quicksprout. Neil also went on to warn “People say that buying rich anchor text link works. If it is too rich it can hurt you and eventually you are going to get caught for buying links.” If you are one of the few still buying anchor text rich links, the time to stop is yesterday. Next week I am going to show you how to create a list of blog topics that your audience and search engines will love, plus we will look at a free tool to help you stick to your content marketing plan. Any of you use Scrapebox to find links? Check back next week to find out how to find a wealth of local citation sites using Scrapebox. We would love to hear your questions, comments, or feedback below! Travis Bliffen is the founder of Stellar SEO, a search marketing firm near St Louis, Mo. Travis enjoys researching and writing about SEO and search marketing. He has been featured on several industry related sites and enjoys sharing actionable marketing advice. Connect with him on Twitter or Facebook.